Super Hero Boy: Ugg Just when I started sleeping ok by myself. Ugg Just when I started sleeping ok by myself. Eek, I had almost blocked out seeing Zodiac in theaters, the story of a serial killer like no other. He has been killing people all over the San Franscio area and the police have absolutely no clue. Then the man who identifies himself as the Zodiac begins sending letters to the San Fransico newspapers claiming the he will kill again and leaving encrypted messages. Ironically the man to decipher these messages is a cartoonist who has an uncanny nack for deciphering codes. The movie is based on the real life cartoonist's book about his experiences. So if this movie scares the crap out of you.. one thing to remember is the Zodiac killer is no made up villain. He is/was a real person and seeing as his last communication was in the 70s there is a pretty good chance that he could still be alive. Nice feeling eh? 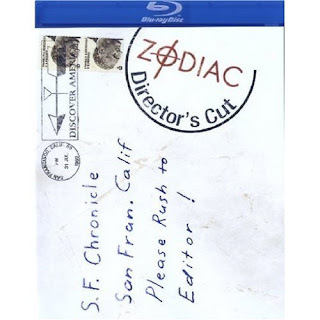 Zodiac 2-Disc Director's Cut has recently been released on bluray and if you love a good murder mystery or in this case even a horror movie you will be thrilled with its new crisp clean release. The movie itself is fabulous, it will keep you tucked safely behind a pillow the entire movie as there is just something terrifying about the fact that the twisted person that this movie is based on is real. The first time I saw Zodiac was shortly after its release and nothing left me feeling more distrait after seeing it since I saw se7en in the theater. Something about the way this film is shot gives it an even more eerie quality. The story is set in the 60s and 70s and the entire movie is filmed in a manner that really makes you feel like your actually in the 60s. The colors are a little drab, and though it does give you a taste of living in the 60s the bluray version gives the whole movie a crisp feel that I don't remember in the theater version. What is really exciting about the Zodiac 2-Disc Director's Cut is the extras. Especially a feature called This is the Zodiac Speaking. This feature documents much more real life occurrences and events concerning the real Zodiac case that the movie does not totally cover. If you feel uncomfortable after watching the movie, hearing the real facts will leave you even more unsettled. Zodiac 2-Disc Director's Cut is available right now on bluray DVD and you can pick up your copy on Amazon!